Vanderbilt Beach Overlooking the Gulf of Mexico. Gulfshore Drive. White Sandy Beach. DIRECTLY ON VANDERBILT BEACH. Top floor, south corner of an 8 story building. Ocean view from every window. 24 total units in building. Large lanai offers south, gulf and north coastal views. Master bedroom overlooks Gulf of Mexico. Spare bedrooms have bayview. Long distance, local long distance and local telephone calls. Owner inspected to insure unit is clean, fully equip, and updates bedding and linens. 3 Bedroom, 2 Bath. Directly on the beautiful Gulf of Mexico. Heated pool, white sandy beach, secured building, private assigned parking slot and boat dock. Tennis. Washer/dryer within apt. Secured wireless Internet and local long distance and nationwide long distance calls are FREE Large lanai overlooking the Gulf of Mexico. Lanai has table for four (4), chair, otteman, chaise and end table. Very suitable for dining. Platinum coffee maker, blender, everyday and formal dishes,large selection of pot/pans, crock pot, electric fry pans, cutlery, utensils, plentiful linens, beach towels, beach chairs, stereo, VCR, T.V., cards, card table/chairs, scrabble and other games, books, puzzles, NO PETS. Tennis courts, sightseeing trolley to area sites/shopping, fantastic restaurants, para-sailing, wave runners, boating, gardens, golf, on the beach restaurants. Numerous sets of towels, complete with wash clothers, hand towels and large bath towels that coordinate with each bathroom. Penthouse Unit Directly on the beach and overlooking the Gulf of Mexico. North, south and west windows have a Gulf of Mexico view. East windows have a bay view. Plentiful sheets, towels, kitchen towels and beach towels provided. All in excellent condition. Your own private, assigned parking slot right at the buildings entrance door. Numerous large, thick beach towels provided. Over looks the Gulf of Mexico. Glass top table located at far end of living room for card games, work away from home. Side by side refrigerator is complete with cold water, ice cube and crushed ice dispenser. Kitchen contain everything you need. Many different utensils, small appliances, pots, pans, formal dinnerware, casual dinnerware, serving pieces, serving trays. Large beautifully landscaped lawn for outdoor games. Off dining room with North, South and West view. Available for rent near by. Building does have a bike rack. Beautiful HEATED pool with Gulf of Mexico view. 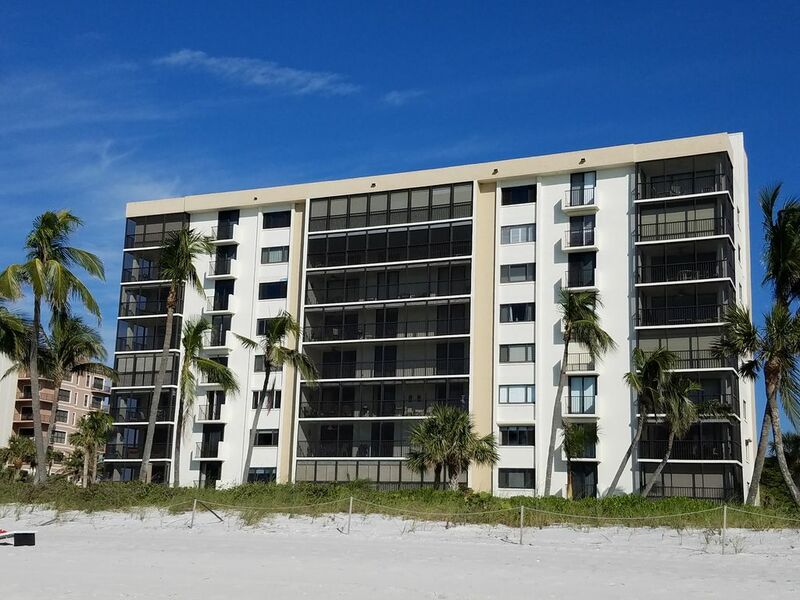 This unit is located directly on Vanderbilt Beach. Private building access to the beach. Unit is a penthouse located on the top floor of an eight story building on the south corner. Views are amazingly beautiful and sunsets are breath taking. A short walk in either direction will enable you to have lunch on the beach or parasail. Clean white sandy beach is groomed each day. Shelling is plentiful and long walks a must. Our unit has all the comforts of home. Plenty of linens, extra sheets, blankets, beach chairs, beach towels and a kitchen stocked with every utensil, pan, small appliance and dishes imaginable.